A year and half ago, I sat at a dive bar in Kansas with Pat Goodman. Bob Seger jammed some "Old Time Rock & Roll" on a bejeweled jukebox in the background. Halfway through a batch of chips and salsa, I told him I was looking for a unique climb to do as far north as possible that included good, unclimbed rock, culture, and wildlife. He smiled, took a sip of local brew and began to tell me about "The Phoenix" a 2,600-foot wall of perfect granite that had been climbed but not free climbed. 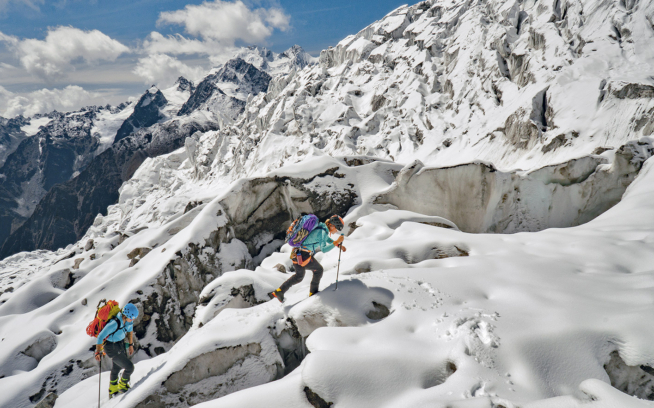 On top of the climb was an untouched ridge of porcelain snow and ice leading to Peak 2451, also unclimbed. 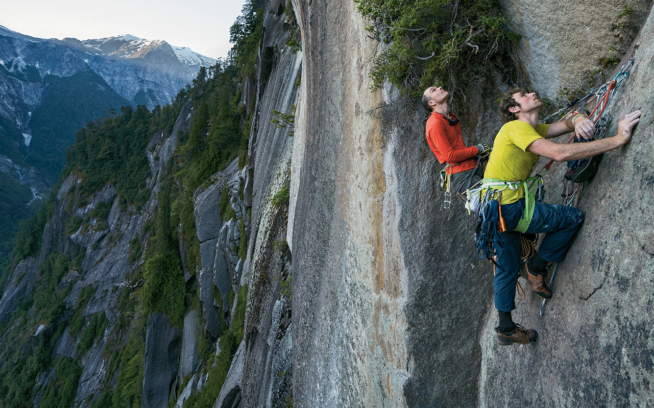 All in all, a 3,500-foot vertical route on one of the big remaining un-free-climbed features in North America. It was love at first bite. "There's a caveat, though," he whispered. "If you want to go, you gotta go with me." Here we are, 18 months later. I am writing from a fishing lodge in the Yukon, a few scabs on my hands and a devilish smile across my face, again eating chips and salsa. Over two days last week, we sent the route mostly onsite, minus a few sections of gratuitous mud removal. The climbing surprised us all by being moderate but consistent, splitter but exciting, with barely any pitch being less than 5.10+ for over 800 meters. For some of the route, we followed an unfinished line called After School Special (5.9 A2) put up ten years ago by Tyler Stracker and team. Master camera pilot James Q Martin joined us for the trip, snapping shots and film along the way. Ultra-cool-headed-ninja-chameleon climber Jeff Achey from Newcastle, Colorado joined also, and we made a great team. Notable pitches include a 40-foot roof offwidth squeeze a la Harding chimney and a 55-meter clean-enough-to-eat-off-of corner crack starting at ten inches then tapering to fingers by its terminus. After a 12-hour all-night descent in the freezing rain, the splitter dream weather decided to bid us adieu, and now we are working off our escape helicopter ride by swinging hammers, pick axes and shovels at the fishing lodge. Easily more effort than the climb itself. Pat's wildlife promise didn't disappoint. We have seen wolf, grizzly and black bear, the northern lights, grayling, all sorts of birds, caribou, and southern red-necked dirtbags in their natural habitat. Our helicopter pilot Bruce says he has flown climbers around the area all summer long, and notices that no matter what country they are from, they, "all have the same sparkle in their eye, and passion in their voice. It is bizarrely consistent. Surely you guys know something the rest of us don't." Well, I know one thing. This climbing thing is not too bad, when it's good. And when its bad, well, it's still pretty good. 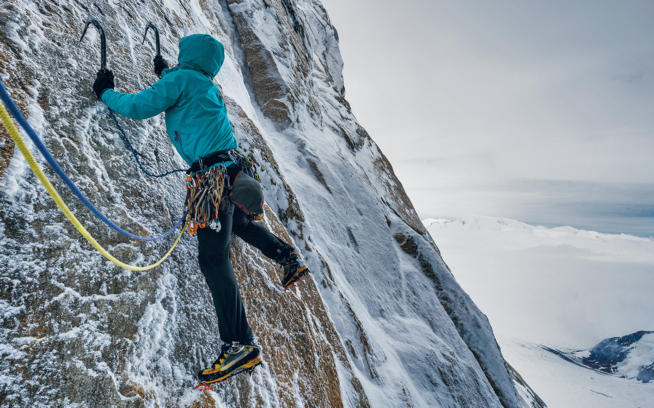 Thank you to the Copp-Dash Inspire Award, Patagonia, Mountain Hardwear, Black Diamond and La Sportiva for helping to make our northern vision a reality. With additional support from CLIF, Sterling Ropes, Goal Zero, Niles Radio and the Inconnu Lodge. Jeremy Collins is a climber and mixed-media artist from Kansas City, Missouri. He is the creator of the highly acclaimed film, The Wolf & The Medallion, as well as Border Country a moving tribute to our late friends for whom the Copp-Dash Inspire Award was created. James Q Martin is a professional photographer based in Flagstaff, Arizona. He is a co-founder of Rios Libres a non-profit group working hard to halt the construction of five dams on the Rio Baker and Rio Pasqua in Chile.